The later maturing tomatoes. 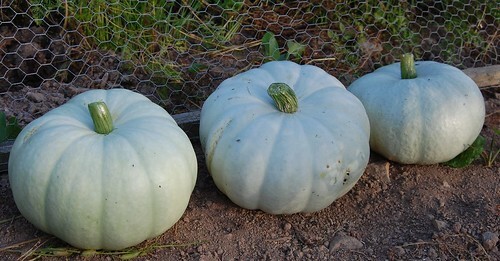 It's been a pretty good summer here but these three varieties are only just beginning to crop properly. The Purple Ukraine plum tomato (I'm an idiot and ate the best coloured ones for breakfast!) is only o.k. for flavour although the fruit is well shaped and the colour intriguing. It has stood up well to outside growing, I'm just not sure its quality is amazing enough for the wait. The Scotland Yellow has been frustratingly disappointing. Last time I grew it, it was in a greenhouse and it did very well, lovely sweet fruit and strong, neglect resistant growth. It has grown strongly this time too and set huge trusses of fruit but few have ripened even now and the skin is hard and blemished. Excellent for a crop of green tomatoes perhaps. Of the four sorts I ended up with this year, this seems to be least resistant to blight but that might just be because of the very lush foliage which doesn't allow the centre of the plant to dry. The Salt Spring Sunrise has done well again, eating one today I realised it has a much better flavour than anything else on the plot this year. Originally saved for its apparent blight resistance it doesn't seem any better or worse than the other plants but it's still an excellent bush tomato and I'll be saving seed from it for next year. As predicted, planting the elephant garlic so late has meant the plants haven't divided into cloves but merely formed huge solid bulbs. This is actually quite sought after in some gourmet circles but I shall preserve the bulbs for planting early next year and wait for the more traditional form. There are also a few offset bulbils which can be potted up to increase the stock. The first fruits of the Whangaparaoa Crown. I've removed these a little bit earlier than normal because I want to reduce the strain on the vines and allow some of the smaller fruit to mature too; we've had almost no rain for several weeks now and although the pumpkin patch is large the plants are beginning to be affected by this. They look good don't they? My plan for creating a landrace of these isn't particularly scientific, I shall just save seed from the best looking fruit and allow nature and time to do the selection for me. Eventually, the local strain will be adapted to the conditions of Normandy and at that point I shall start calling it Prince of Normandy or something equally naff, unless I'm dead before then, obviously. Kitten diary tomorrow I hope. I should have weighed them today but forgot. My tomatoes have done quite well plant-wise. They are heavy with fruit, but only the tiny super sweets have begun to ripen. I'm nervous because it's September already! Next year I'm planning to include some heirloom varieties. 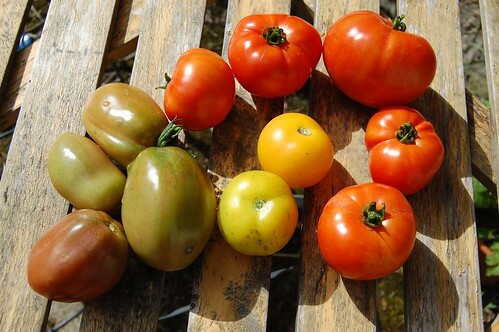 One is called the Hillbilly Potato Leaf tomato and is yellow with a burst of orange up from the blossom end. I can't wait. It is possible, they say, to pick tomatoes green and ripen them indoors although the best flavour always comes from the sun in my opinion. The Hillbilly potato leaf sounds like fun, I shall look forward to seeing how you do with it. I found that I left my comment on the wrong post. It was on Really Silly Gadget. Could you move it to this one? I don't know of any way to move comments from one post to another but I'm glad you found the post helpful. Thanks for commenting.